Now, finally, George De Jonge can let himself off the hook. One year ago, De Jonge, his daughter Cathy Sinclair, and his granddaughter Taylor Sinclair were just seconds away from a priceless family snapshot –winning a 7 Class championship together at the Calgary Stampede’s Team Cattle Penning Competition – before misfortune struck. Monday night at the Scotiabank Saddledome, the trio got another chance . . . and slammed the gate on victory. Proving that blood is thicker than melancholy, the three West Coasters from Langley, B.C., saddled up again Monday on the final night of the Stampede’s Team Cattle Penning Competition – and ended up top of the heap in 7 Class, with solid runs of 38.11 seconds in the third round and 33.20 seconds in the 10-team final. 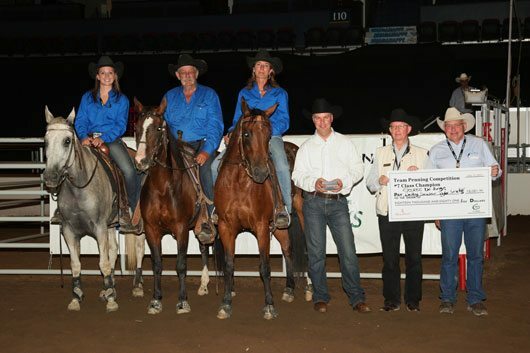 The winning team laid down an aggregate, four-round time of 137.41 seconds on 12 head of cattle, collecting a cheque for $18,081 and those coveted, handtooled Stampede championship buckles. Their spiffy final run triggered the fourth and final lead change of the money round, and left them standing alone among the 149 outfits that began the 7 Class showdown back on Wednesday at the Okotoks Agricultural Society. The team of Rob Schalk of New Serepta, Alta., Mandy Schalk of New Serepta, Alta., and Bev Mailer of Leslieville, Alta., finished with an aggregate time of 156.61 seconds on 12 head, good enough for the reserve championship and a runner-up cheque of $12,218. The last team out on the floor, and the only one with a chance at threatening the De Jonge brood’s title, couldn’t measure up, scoring a final-round 52.26 seconds on two head of cattle. Cayley Rishor-Olney of Selah, Wash., Rae Gulley of Gilbert, Ariz., and Doug Ohlmann of Thorsby, Alta., ended up seventh overall. Standing second overall entering Monday’s final, Cathy Sinclair, her dad, and her daughter had their strategy all worked out. 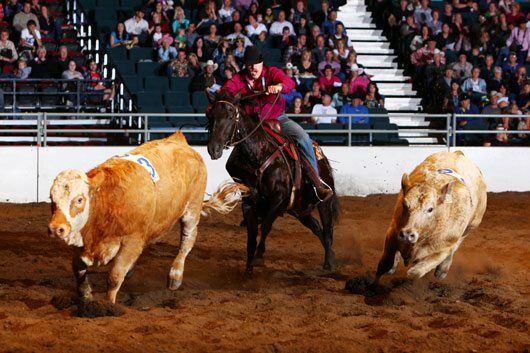 The Calgary Stampede boasts one of the biggest team penning competitions on the continent. This year, 492 teams from across North America converged on Calgary for a piece of the $225,000 in cash and prizes that were up for grabs in four classes over four nights of competition at the Saddledome.